My husband and I are fortunate to have lots of relatives in wine country. They didn’t grow up there, but over a period of years each family moved from Vancouver to the sunny shores of Lake Okanagan, and we always love to visit. The dry, rocky landscape, unique restaurants and abundance of vineyards are enough to capture our imaginations each time we’re there. In the summer, as we drive along the lake shore passing row after row of grapes ripening in the sun, we think to ourselves, how could you not want to live here? Every time we visit we return with the relaxing afterglow of a satisfying vacation. We sure are lucky! We recently drove up on the Thanksgiving long weekend, on a mission to give my brother and his girlfriend the full Okanagan wine tasting experience. On the first day, we planned to lunch at Quail’s Gate in their beautifully designed Old Vines Restaurant, then head to a large cluster of wineries along the Naramata Bench. We arrived at Quail’s Gate and were greeted by a thick wall of people in the tasting room. It was packed with wine tourists, clutching leather wallets and wearing fashionable sweater sets. We stood in line to do a tasting and eventually made it past the crowds to the solid wood tasting bar. The view from their sweeping bay windows, over the rolling hills striped with rows of grapes and across the lake to the rocky, arid shores beyond, was worth the wait alone, but in the end we didn’t buy any wines. Next stop was the Old Vines Restaurant where we were also unsuccessful. “Do you have a reservation?” the teenage hostess asked us, standing next to two other baby-faced employees. We didn’t. The hostess burst out in a short fit of giggles. “Well, we’re fully booked until Tuesday.” Really? It was Saturday. We peered past her and frankly, it didn’t look busy at all. And what kind of a restaurant books up an entire weekend’s worth of seating, leaving absolutely no allowance for any walk-in diners? Oh well. Apparently, we were out of luck. 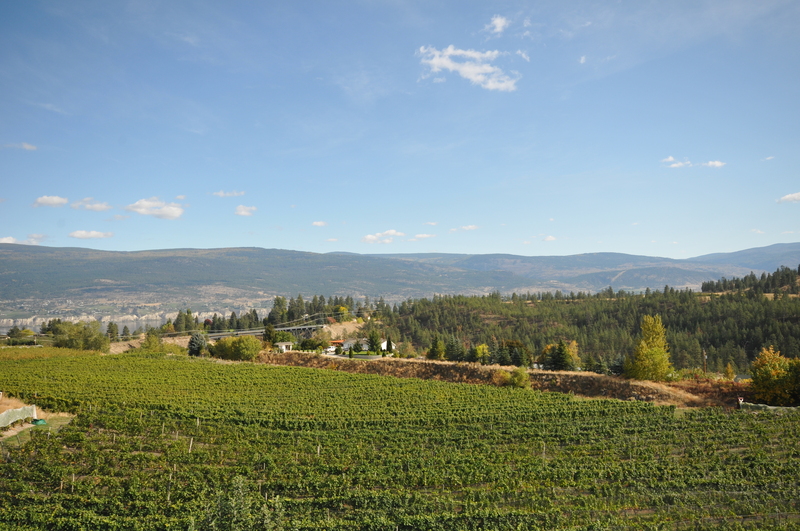 We made a quick stop at Mission Hill Estates, since the views from up there are also stunning, then we changed directions and headed straight for the Naramata Bench. With so much family living in town, we were fortunate enough to enlist my husband’s cousin as our designated driver for the day – a must considering the new driving rules, and our extensive plans for wine tasting! After a 45 minute drive Southeast along the highway we arrived at the winery-covered hillside of Naramata. Our plan of attack was to start with the wineries farthest away, and work our way backwards in the direction of home. 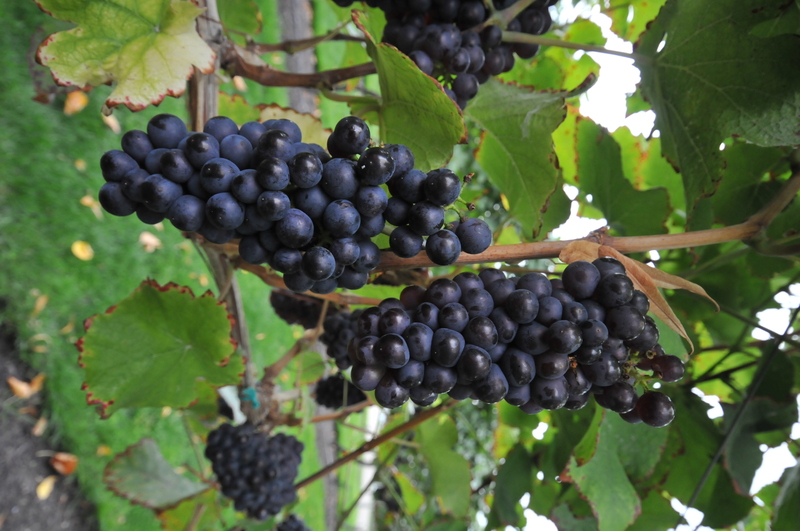 We went to six wineries in total and by the end of it we’d tasted and spent enough. At a certain point everything starts to taste the same, especially if you opt to swallow the wine (like we did) instead of spitting it. Lang Vineyards was our first stop, and we were already partial to their wines. We’d served their 2008 Marechal Foch and 2008 Pinot Gris at our wedding the previous summer. This year we went home with two bottles of 2006 Gewurztraminer and a 2007 Pinot Auxerrois instead. After Lang, we hopped over to Soaring Eagle since I LOVE their rose! We served this at our wedding too and it was definitely my drink of choice. We’d only ordered one case since it was hard to gauge how many people would request it, but thankfully our bartenders quickly got wise to my preference for pink. As the bottles started to turn up empty, they hid a few for my own special stash! 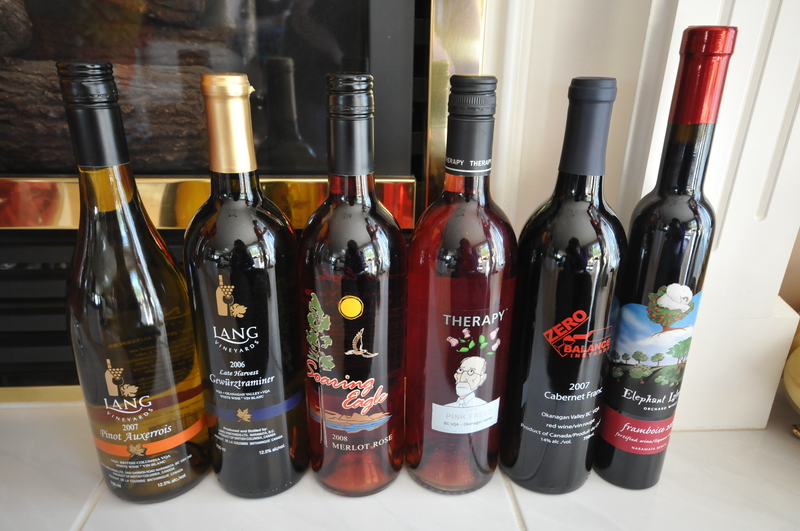 Therapy Vineyards is the winery with Sigmund Freud or rorschach ink blots on their labels. Their wines were okay – between the four of us we bought 3 bottles – but an infestation of pesky fruit flies was a bit of a turn off. Tucked away in a blossoming fruit orchard, Elephant Island was an absolute delight to visit. The small tasting bar was festively decorated with quirky elephant-themed art and handicrafts, and out the door in their courtyard a live country band was jamming away with a mix of folksy, old-school funk. If we hadn’t already stopped for food on the way to Naramata, we might have stayed here to eat instead. Focusing solely on dessert wines, hence their fruit-bearing surroundings, their products were fantastic to taste, and expertly arranged on the tasting list. Each sip was even more pleasing than the previous bottle. Next we stopped at Zero Balance. They didn’t have many wines on offer, but we bought one bottle of red instead of paying the $7 for tasting fees and leaving empty-handed. Laughing Stock was next on our list and it took a little effort to find. Their label design, curious looking at first, actually shines some light on the owners of the vineyard. Both stock traders by day, this husband and wife team decided to change their pace of life and open a winery instead. Of course, their investment-savvy friends thought they’d gone crazy, leading to the name Laughing Stock. Their label design takes a nod from the stock world as well. Across the bottle is a stock ticker tape, representative of the exact state of the market on the day the wine was bottled. An interesting idea, and a great present for any financially-minded wine lovers in your life.